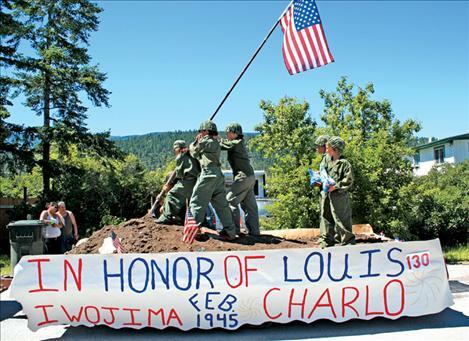 The Morin family and friends pose as the famous Iwo Jima memorial during Arlee's Fourth of July parade. 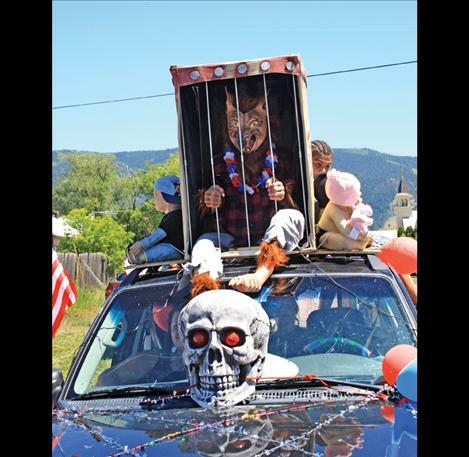 A caged creature howls and screams on top of a terrifying parade float. 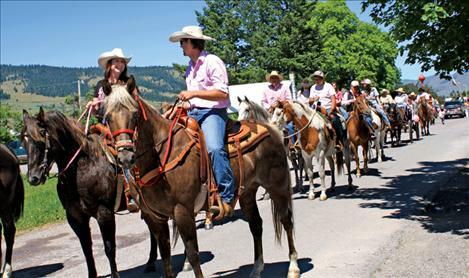 Spur the Cancer Out of Montana's parade entry consisted of nearly 50 riders and horses dressed in pink. 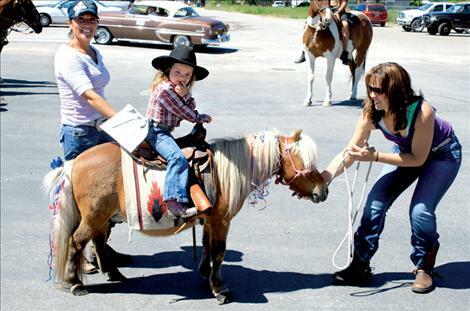 A miniature horse and cowgirl join the parade line at Arlee High School. 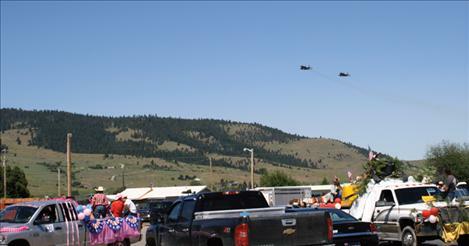 ARLEE- The Arlee community celebrated the Fourth of July with a pancake breakfast benefit for the volunteer fire department, an F-15 flyover, and a parade that closed northbound traffic on Highway 93 for more than an hour. Hundreds of Mission Valley residents piled into Arlee’s old fire hall in the early morning hours to show support for their local volunteer firemen. An annual tradition with no clear origin, the event is thought to be more than 40 years running. It may have started as far back as 1952 when the district was created. 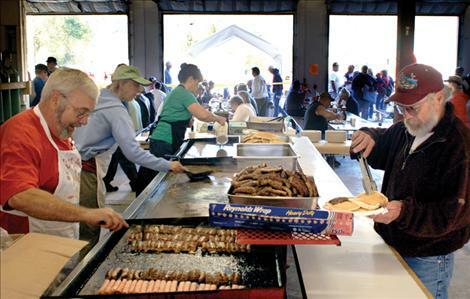 Raising around $6,600 for the fire department, fire chief Ken Light called it a successful event. “We’re partially funded by the state, but this means a lot because this is how we buy a lot of the stuff we need,” said volunteer fireman Lorin Light. The Arlee fire department is one of only a few combined fire and ambulance services in the state. In past years, money from the pancake benefit was used to purchase thermal imaging equipment to better locate hot spots in fires and instruments that detect toxic gasses. With this year’s take, chief Ken Light hopes to finish the new fire hall’s kitchen and training room. 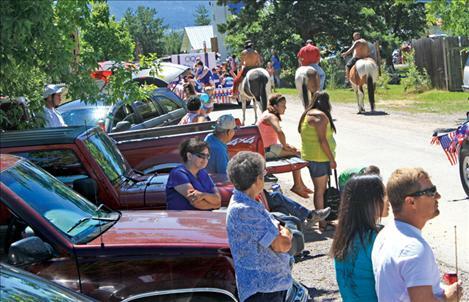 Shortly after the pancake breakfast ended, parade floats and spectators began to gather in the Arlee High School parking lot as event organizer Tim Morin began closing northbound traffic on Highway 93. 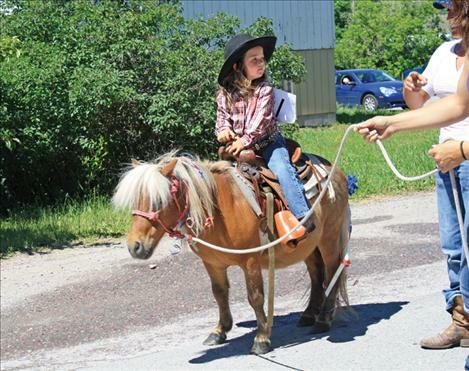 As number one son, part of Morin’s job is closing down northbound traffic on Highway 93, to complete the figure-eight parade route, which runs throughout Arlee. When the new Highway 93 was built, southbound traffic was taken out of downtown Arlee. 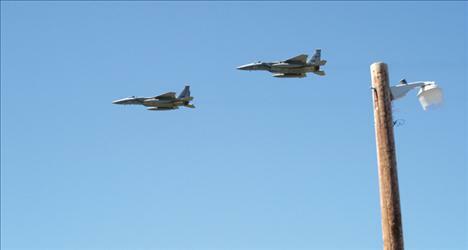 Appearing on the horizon as mere specks, the two planes fly directly over the parade route at 350 miles per hour. 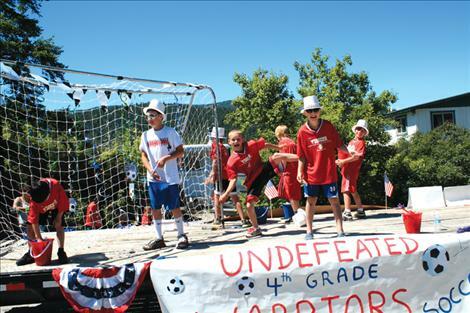 The crowd cheered and Arlee’s Fourth of July parade was on. 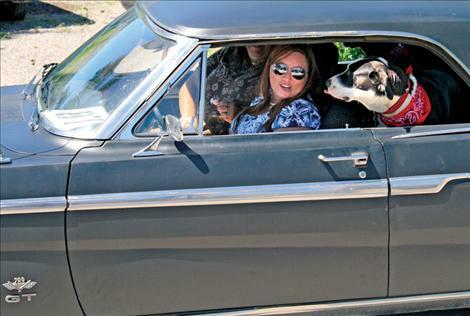 A mass of horses, fast cars and creatively-themed floats rolled through the streets. 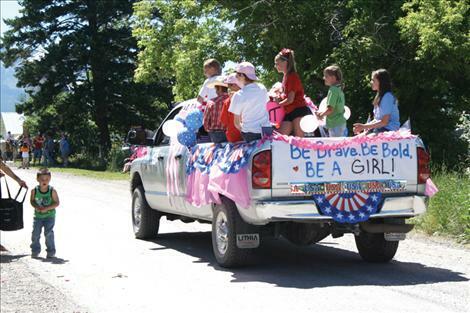 Smokey the Bear made an appearance aboard a fire department vehicle; Spur the Cancer Out of Montana showed up with nearly 50 horses and riders wearing pink; and Tim Morin drove past in a float depicting the flag-raising at Iwo Jima. 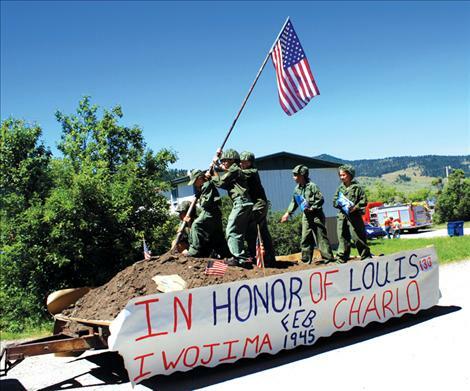 Private Louis Charlo was a Marine from Mission Valley who served in WWII. He was a part of the first flag-raising on Iwo Jima(the famous picture was posed and taken later in the day). Charlo was killed in action while trying to save a wounded friend.